Scheduling cleaning exams every six months is important if you wish to maintain good oral hygiene, but how you take care of your teeth and gums between each exam is even more important. Patients understand that brushing and flossing should be done on a daily basis, but do you know what you’re preventing by keeping up with the routine? Tooth decay – Tooth decay is a leading cause of tooth loss and it occurs when plaque erodes the natural enamel found on teeth. Periodontal Disease – This progressive condition is responsible for tooth loss, gum recession and other problems. 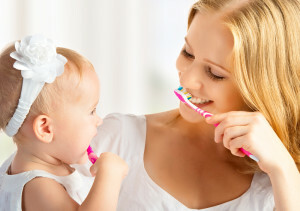 It is caused by a buildup of plaque, but brushing your teeth helps remove unwanted plaque and it’s necessary if you want to avoid periodontal disease. Halitosis – Better known as bad breath, halitosis is caused by food particles getting caught between the teeth. Consistent brushing and flossing will prevent halitosis. Staining – Tooth staining or yellowing of the teeth is caused by a number of factors, including smoking, coffee and tea. If you brush and floss on a regular basis and schedule cleaning exams, staining won’t be a problem. If you need additional help on properly brushing and flossing your teeth, we would be more than happy to assist you at your next appointment.